If you’re looking for wild aggressive growth, this stock is NOT for you. If you’re looking to “sleep well at night” while also receiving steady growing dividend payments and a share price that will likely rise more than enough to offset the dangers of inflation, then this blue chip among blue chips is worth considering. We’ve owned it for years, it has performed very well, and we expect its strength to continue for many years into the future. Blue chip companies are known to weather downturns and operate profitably in the face of adverse economic conditions, which helps to contribute to their long record of stable and reliable growth. We continue to own a healthy allocation to Johnson & Johnson (JNJ) within both our Blue Harbinger Income Equity and Disciplined Growth portfolios. 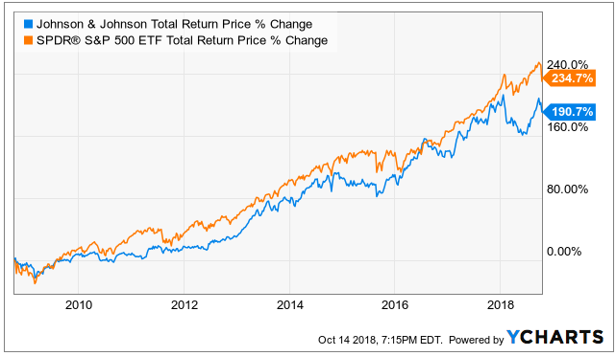 The position had grown quite large in the Disciplined Growth portfolio over the years, and we recently trimmed that position for risk management and portfolio rebalancing purposes (and to make a little room for our recent Netflix purchase), but make no mistake—we continue to like JNJ’s long-term prospects. It is a blue chip among blue chips. Johnson & Johnson is a well-diversified healthcare company, and the business is exhibiting growth across its three operating segments: Consumer (+0.7%), Pharmaceutical (+19.9%), and Medical Devices (+3.7%). The groups represent 20%, 45% and 35% of total sales, respectively. JNJ announced earnings on Tuesday (10/16), and the company beat expectations for both revenues and earnings (these are good things). JNJ currently benefits from blockbuster drugs (Remicade and Stelara) and new pipeline drugs (10 in pre-registration). It also has ongoing new medical devices (e.g. innovative contact lenses, less invasive surgical tools), and strong demographics on its side (an aging population with increasing healthcare needs). JNJ's free cash flow (operating cash flow less capital expenditures) is over 20% of sales, thereby allowing continuing long-term dividend growth, ongoing share repurchases, and acquisition opportunities. From a valuation standpoint, JNJ sits near the middle of its historical range in terms of forward ratios including price-to-sales, EV-to-EBITDA, price-to-earnings, and dividend yield. However, growth prospects should easily drive the shares higher in the years ahead. Competitive advantages include high switching costs for customers in the device segment, and strong brand power from the consumer group. Johnson & Johnson is the world's largest and most diverse healthcare company. Johnson & Johnson operates over 250 companies in what is termed "the Johnson & Johnson family of companies". Three main divisions make up the firm: pharmaceutical, medical devices and diagnostics, and consumer. The drug and device groups represent close to 80% of sales and drive the majority of cash flows for the firm. The drug division focuses on the following therapeutic areas: immunology, oncology, neurology, pulmonary, cardiology, and metabolic diseases. The device segment focuses on orthopedics, surgery tools, vision care, and a few smaller areas. The last segment of consumer focuses on baby care, beauty, oral care, over-the-counter drugs, and women’s health. Geographically, close to half of total revenue is generated within the United States. Sales have been growing across all three segments, and the healthcare industry is expected to continue to grow based on demographics. The number of JNJ products has been increasing, and the company has 10 products in pre-registration (good for the pipeline, and future growth potential). JNJ is the industry leader with 14 billion dollar + brands. JNJ has been delivering pharma growth for the last seven years at a rate (+8.6%) twice that of the Pharma industry (+4.3%). Johnson & Johnson needs to overcome several roadblocks, including remaining litigation surrounding central nervous system drug Risperdal, surgical mesh products, and metal-on-metal hip and knee implants and other product recalls that could damage its reputation. Worth mentioning J&J was very recently cleared of liability in a new jersey talc cancer case. Robert Wood Johnson joined his brothers James Wood Johnson and Edward Mead Johnson to create a line of ready-to-use surgical dressings in 1885. The company produced its first products in 1886 and incorporated in 1887. From a discounted free cash flow basis, if free cash flow is 20% of sales, and sales (TTM) were $80.7 billion, then free cash flow is $16.1B. Assuming a long-term growth rate of only 2.05%, and a weighted average cost of capital of 5.9% (per GuruFocus). Then the company has an enterprise value of 16.1B/(5.9%-2.05%)= 418.2B. Adjusting for debt (liabilities) of $58.6B, gives JNJ an equity value of $359.6 billion, which is equal go its current market cap. However, given ongoing growth expectations (driven industry/demographic growth and competitive advantages), JNJ will likely grow faster than 2.05%, given the shares continuing long-term price appreciation potential. JNJ competes with a variety of companies across its business segments including. For example, Johnson & Johnson's major competitors include Pfizer, Merck, and Novartis. In the medical devices space, its competitors include Medtronic (MDT) and Boston Scientific (BSX). In the orthapedic implants segment, it competes with Zimmer Holdings (ZMH) and Stryker (SYK). Here is a look at forward PE ratios and price to sales ratios for competitors. According to research from the Economist and Deloite, global health spending is expected to reach $8.7 trillion by 2020. The healthcare sector is expanding due mainly to demographics (aging population, higher prevalence of chronic diseases, greater costs of dementia care and treatment, and arguably wasteful spending throughout the industry. JNJ has a history of generating returns on capital greater than its cost of capital. Due to the large free cash flow generation, the company has a long history of share repurchases and dividend growth. JNJ does have a history of acquisitions. For example, in pharmac, the historical spit between internal and external growth sources has been 50/50. Pharmaceuticals is likely the largest catalyst as this is the largest of JNJ’s three segments and the fastest growing (and most volatile), in terms of new and old drugs coming on and off patents. JNJ enjoys a strong competitive advantage versus peers supported by its intellectual property in the pharma segment, high switching costs in the device segment, and strong brand power in the consumer segment. JNJ declined less than the S&P 500 during the financial crisis. The business and dividend are viewed as safe and steady. The beta is below 1.0.
central nervous system drug Risperdal, surgical mesh products, and metal-on-metal hip and knee implants and several product recalls that could (but likely will not) damage JNJ’s strong reputation. Insiders own a very small position (0.09% of shares outstanding), considering the company’s very large market capitalization. CEO Alex Gorsky owns 0.01%. JNJ is a triple threat blue chip among blue chips. It offers low volatility (due to its large, well-diversified, industry leading business), a healthy growing dividend (supported by a wide margin of free cash flow), and the potential to offset the threatening impact of long-term inflation considering the value of this company (and its shares) will likely continue to increase steadily in the years ahead. We continue to own shares of Johnson & Johnson, and the shares continue to help us sleep well at night. Newer PostThe Fed’s Folly: Is The Growth Bubble Bursting?